Photo, right, of Marchesa Luisa Casati Stampa di Soncino (23 January 1881 - 1/ June 1957), Italian heiress, muse and patroness of the arts in early 20th-century Europe. She died 61 years ago today (June 1, 2018). She was known for her wild and outrageous eccentricities and fashion from wearing outlandish clothing accessorized with live leashed cheetahs to live snakes as jewelry (necklaces and bracelets). 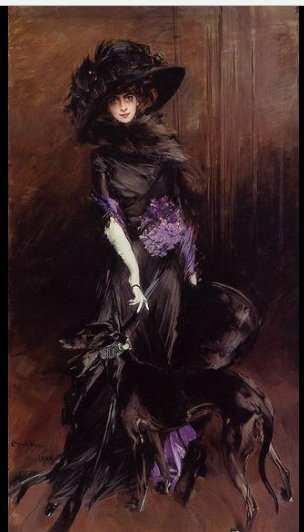 Photo left is Marchesa Luisa Casati with a greyhound. Collage below of the many faces and "way-ahead-of-her-time" fashion looks of arts advocate, Marchesa Luisa Casati (1/23/1881-6/1/1957). Interesting to note the many historical fashions of Marchesa are repeated by world renown award winning fashion designers as well as many fashion and lifestyle magazines.